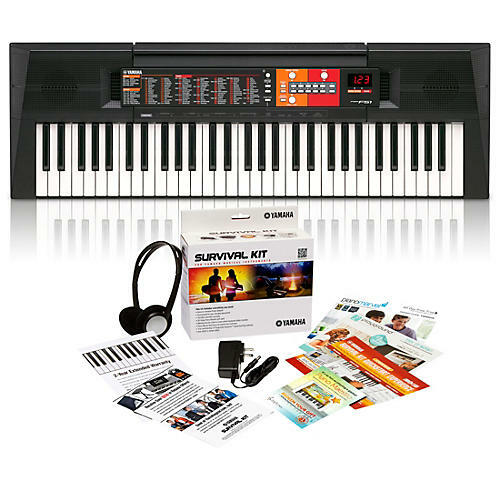 The PSR-F51 is the lowest cost, entry-level portable keyboard that Yamaha offers. With 61 keys and basic features, it's an easy choice for a first keyboard. The PSR-F51's compact and lightweight design packs in a regular size keyboard together with 61 keys, 120 Voices and 114 Rhythms from all over the world. What’s more, this instrument is ideally suited to a wide range of different playing scenarios; not only is the PSR-F51 great for beginners and students, you can also power it with batteries for musical performance on the road. This essential add-on contains everything you need to make using your Yamaha PSR-F51 just that much more enjoyable. This accessory bundle contains a power adapter and headphones. Plus, you also receive a two-year extended warranty, trial educational software and over $200 of rebate offer on great Yamaha instruments and accessories.